Mortar shell from Syria explodes on the Israeli side of the border as fighting from Syrian civil war spills over yet again. For the second time in as many days, fighting from the civil war in Syria has spilled over into the Israeli side of the Golan Heights. A mortar shell from Syria exploded on the Israeli side of the border on Sunday evening, around 8:30 p.m. local time, as Israelis were celebrating the start of the Sukkot holiday. The shell landed in an open area, causing no physical injuries or damages. Due to the fact that it was not headed towards a populated area, no sirens were sounded before the explosion. A similar incident occurred on Saturday evening, when a projectile from Syria exploded in the Golan Heights. Rocket alarms did not go off and there were no reported casualties or damage. 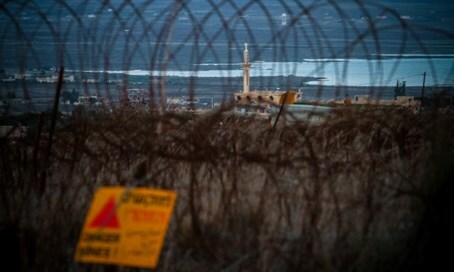 In August, rocket fire from Syria struck the Golan Heights, in an incident Israel said was a direct order from Iran. Defense Minister Moshe Ya’alon later warned the West that the incident was a “promo” for what will happen once the sanctions on Iran are lifted as part of the nuclear deal signed with the West.